Take any number n. If n is even, divide it by 2, if n is odd, multiply it by 3 and add 1. Repeat the process indefinitely, and you'll eventually reach 1. 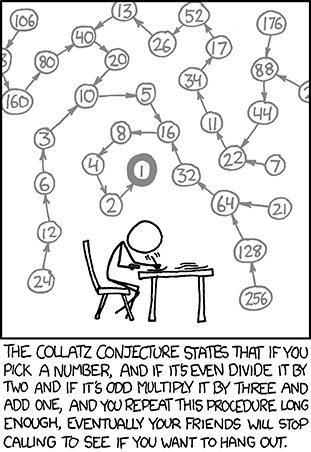 A Collatz sequence is the sequence of number generated from a specific number. The input starts with N, the number of cases. N lines follow, which each contains 1 integer. Print out the correct numbers for each case on its own line. Click on "View Raw I/O" below to view sample input and output. Given a num variable, can you print all the numbers in num's Collatz sequence until 1 is reached? Print the numbers space-separated (and each test case on its own line). Quite simple, one problem was to stop the toop, eventually I've managed it. For me it wasn't about stopping the loop but actually how to get the number print the first time(initial input) and the last time (1) without having the loop interfering. Whats wrong with my code? It keeps giving me the "Runtime error"
@Mikas Your else says "num = num * 3 - 1" it should be +1. I dont understand why would 3-1 cause runtime error? How did you know that it would get stuck in a loop. Thanks for the insight. Love what you guys are doing. @Learneroo should I create two loops? @Bernard, that's not necessary. You can create one while loop, with a condition inside it that determines what number to go to next. your correct output's are wrong. Sorry, due to a change yesterday it was mistakenly showing the number 5 for the count, it's been fixed.